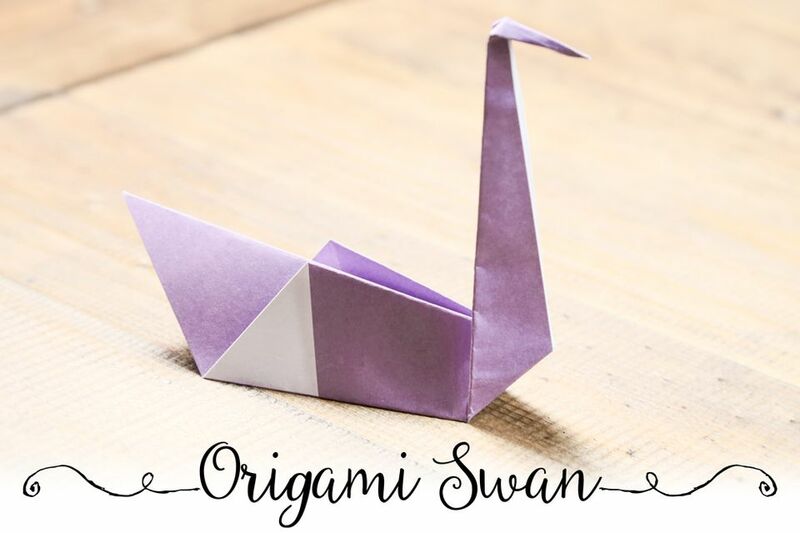 The traditional origami swan is one of the most simple origami bird models out there, a lot of people start off with the origami crane but find it too hard. This model needs just one sheet of square origami paper and will take just a few minutes to complete. You will end up with a pretty origami swan that can stay up on its own. You can use this origami model as a minimalist decoration, make lots of them for a stylish wedding display, or it can serve as a great chopstick holder for a Japanese meal. For a two-color effect, use paper that has a color or pattern that is different on each side. Use origami paper or thin paper for this model. If you're new to origami, this is the perfect model for you to start with. For extra help, check out a series of origami basic fold instructions for beginners. You may also be interested in making the origami boat, origami masu box, and the origami fox box. If you love traditional Japanese designs, check out some origami papers that you can download for free. All you need is some white printer paper, a printer, and something to trim the papers with. Fold the bottom corner up to the top. Fold down a small section to make the swan's head. If you ended up with a bit of a mess, don't worry. It takes practice to learn origami and making new models, just make sure your folds are as precise as possible and it will turn out well in the end. You can check out more tutorials and video instructions and practice working with origami. The word "origami" comes from the Japanese from ori meaning "folding" and kami meaning "paper." It is the art of paper folding, which is often associated with Japanese culture. Traditional Japanese origami has been practiced since the Edo period from 1603 to 1867. Although associated with Japanese culture, the word "origami" has been adapted as an inclusive term for all paper folding practices, regardless of their culture of origin. The goal is to transform a flat square sheet of paper into a finished sculpture through folding and sculpting techniques. Most origami practitioners discourage the use of cuts, glue, or markings on the paper. Although, the Japanese have a term for cuts allowed on the paper, kirigami.